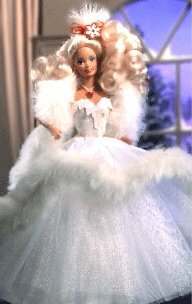 1989 Happy Holiday Barbie was the second ever Holiday Barbie. I can only imagine the pressure the designers must have felt doing this doll because of the success of the first one. This Barbie still has the smiling "Superstar" face and tons of blonde hair. She is in a very glamorous all white gown with a huge white tulle full skirt. The dress is trimmed in white fur and she has a white fur stole. She has a red snowflake hair decoration that matches her box - which is red with white snowflakes. 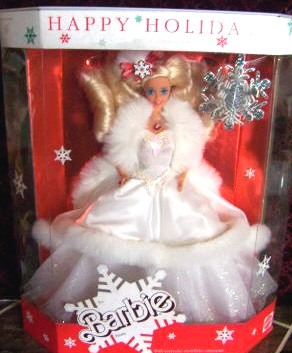 Hallmark released the 1989 Holiday Barbie ornament in 1997 as a Collector's Club Special edition - meaning it can be harder to find than some of the other Barbie ornaments. These dolls still seem to be plentiful and are fairly easy to find at a good price - the market values of all of the Holiday Barbies have dropped dramatically over the years.